Willie Mullins scored a sixth winner of The Festival 2017, going to the top of the trainers' table at the meeting, when Penhill beat Monalee by three and a half lengths at odds of 16/1. It was his first Albert Bartlett Novices' Hurdle triumph. It was a second success of the day for jockey Paul Townend and a 356/1 double for him and Mullins on the day. Mullins: "It isn't a race that has been lucky for us in the past. Penhill has class. We were trying to win with him over two miles and he just couldn't handle the pace of top-class racing over two miles, so we let him out to three miles and he impressed us so we said we'd go for this race. As he gets more experienced, maybe he could come back in trip. "We'll probably go to Punchestown now, and then go back on the Flat I think; Ascot, and then maybe the Melbourne Cup. Maybe he won't be good enough when we try the Flat game with him, but we'll see. He's got a typical profile for the type of horse we manage to bring back to the Flat. The owner was keen to do that and sent him to me with that in mind." Owner Tony Bloom, who sent Penhill to Mullins at the start of this season and who was collecting his first Festival winner's trophy, said: "I am over the moon for everyone involved. It was a great ride again by Paul and we are delighted. It is a brilliant horse that we have here. "He was looking good all the way and, certainly two out, we really were quite expecting it. He ran a brilliant race - his hurdling was a lot better than it has been and he has got the pace. "We don't want it too fast and the race was perfect for him - it was brilliantly run. "I haven't had many Cheltenham runners, so to have a winner at The Festival means a lot to me. It's really exciting. There are quite a lot of friends here today and a lot of us were on at 16/1 and 20/1, so we are delighted. 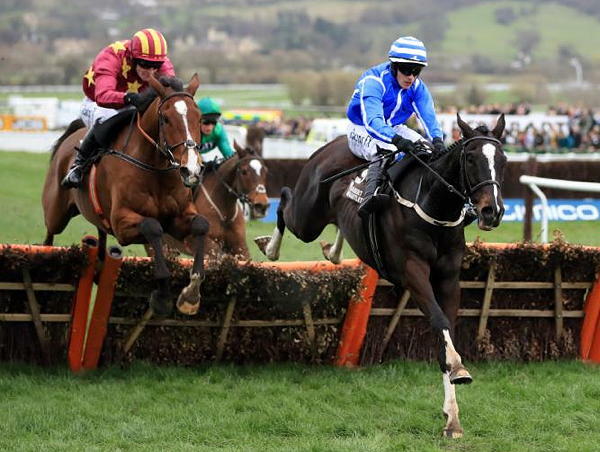 "I have only started having horses with Willie Mullins this season, when we decided to go over hurdles with Penhill. He is one of the best trainers ever, and we have a great relationship. "I was slightly concerned that Paul might be having a glass of champagne or two before jumping on [having won the last race on Arctic Fire], but he went from one winner to the other. Two 20/1 winners - what a brilliant day he has had." Paul Townend made it a quick fire 356/1 double when taking the Albert Bartlett Novices' Hurdle by three and a half lengths on the Willie Mullins-trained 16/1 chance Penhill, following the combination's Randox Health County Hurdle victory with Arctic Fire. "Penhill is class horse, just like the last winner," said the winning jockey. "We kept him wide to help him get into a rhythm and everything went right for him. "I never really had any worries - luckily we avoided the late faller - but you need that bit of luck. I suppose coming down the hill I knew that I had loads of horse under me and that we'd be going close. "I won on him over three miles at Limerick over Christmas on heavy ground and he saw it out really well that day. The trip gives him a chance to warm up, and his Flat class came into play up the hill today." Reflecting on riding a back-to-back double, Townend added: "It's grand, there's no feeling like it. It's a brilliant day." Henry De Bromhead was delighted with the performance of 8/1 shot Monalee, who finished a three and a half-length second. Always prominent under David Mullins, the six-year-old son of Milan was vying for the lead approaching the final flight, but was unable to match the winner's potent turn of foot up the Cheltenham hill. Nigel Twiston-Davies' Wholestone (13/2) was a further four lengths back in third. De Bromhead said: "Unfortunately, he just met a very battle-hardened horse there. Anything he does this year will hopefully be a bonus for when we go chasing as that is going to be his game. "I'm delighted with the run but disappointed to be beaten." David Mullins, Monalee's rider, said: "I am absolutely thrilled to bits with him. He is going to improve double next year when he jumps a fence. "He has my heart racing when I go to see him every day so I'm delighted." Nigel Twiston-Davies was also happy with the run of third-placed Wholestone. He said: "He has definitely run to his mark. We beat all the English horses out of sight and beat the favourite Death Duty. It was just two good Irish horses who have come over that beat us. He ran really well. "We will definitely go to Aintree next and hopefully the two in front of us will stay away."